Two Southwest Side beat officers and a Chicago police detective allegedly submitted “virtually identical” false reports from the scene after another officer shot and killed 17-year-old Laquan McDonald in the middle of South Pulaski Road in October 2014. Does that mean the men conspired to cover up the shooting in an attempt to make it go away? Or was there a more innocent explanation for those reports? 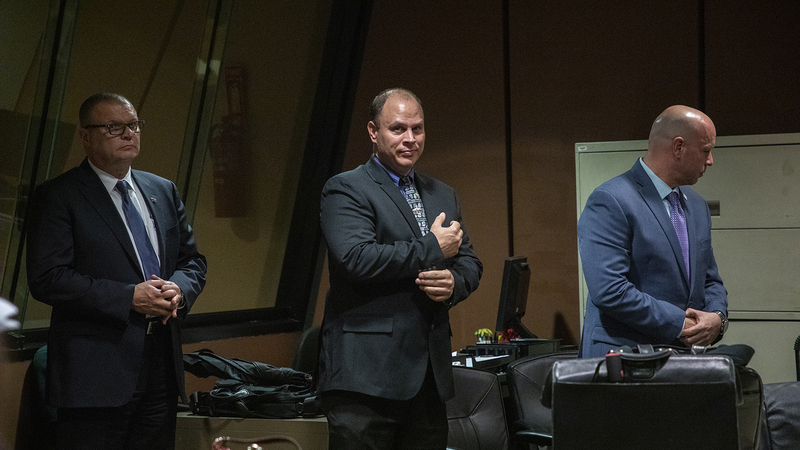 Chicago Officer Thomas Gaffney, former officer Joseph Walsh and ex-Detective David March each face charges of conspiracy, official misconduct and obstruction of justice. They are accused of falsifying official reports from the scene of the 2014 shooting in order to “conceal the true facts” of McDonald’s death in an attempt to shield fellow Officer Jason Van Dyke from prosecution. Following a pair of delays, Cook County Associate Judge Domenica Stephenson is now set to announce her verdict in the unprecedented case on Thursday, more than a month after the trial’s final witness testified. All three defendants opted for a bench trial, meaning the judge will decide their fate rather than a jury. Through four days of testimony, special prosecutors attempted to prove the defendants followed an unofficial code of silence and “violated the public trust” by covering for their fellow officer. They allege Gaffney and Walsh submitted reports they should have never filed – which falsely indicated McDonald had aggressively swung a knife and battered three officers – while March lied in his description of the dashcam video of the shooting, saying it was consistent with those officers’ statements. That video was replayed multiple times at trial. It shows McDonald was carrying a knife, but he did not batter any officers and did not appear to threaten “the imminent use of force” immediately before he was shot, as the officers claimed. But inconsistencies, even identical inconsistencies, alone may not be enough for a conviction. “I don’t know that there’s enough evidence to conclude they were guilty of conspiracy,” said Richard Kling, a clinical professor at the IIT Chicago-Kent College of Law. “Realistically, the fact that everything looked the same doesn’t necessarily mean people conspired together. I think that’s going to be the big hurdle for (Stephenson). Van Dyke was ultimately charged and prosecuted for the shooting. In October, a jury found him guilty of second-degree murder and 16 counts of aggravated battery with a firearm – one count for each shot he fired at McDonald. He is set to be sentenced Friday. Defense attorneys in this case deny the three men ever entered into any conspiracy to cover for Van Dyke, saying the evidence presented at trial didn’t bear out prosecutors’ claims. They argued any possible errors in the police reports were either simple mistakes or due to a quirk in the Chicago Police Department’s computer filing system, rather than an organized cover-up. Only March’s attorney James McKay called a witness to testify for the defense. None of the defendants testified on their own behalf, with the defense instead relying on their cross-examination of state witnesses to raise reasonable doubt for the judge. If convicted, the defendants face possible prison sentences of two-to-five years on both the conspiracy and official misconduct charges, and one-to-three years for obstruction of justice. Instead of focusing solely on what happened after the shooting, defense attorneys spent significant time detailing McDonald’s actions in the minutes before his fatal encounter with Van Dyke. McKay said this trial had nothing to do with officers violating “public trust,” as prosecutors had claimed, but was instead all about McDonald violating the law. Indeed, McDonald attacked a truck driver with a knife and stabbed at a police squad vehicle driven by Gaffney, popping a tire and scratching a windshield, before he was killed. But Kling said focusing on those actions was a strange tactic for the defense to take. Mitchell believes that focus represents the “theme” of the case and gets at why the officers may have acted the way they did..
“Whether that was a great legal decision, I don’t know, but it speaks to the kind of concept that a lot of people saw Laquan McDonald in the system as a kid who was bad and these officers as people who were good, that were protecting the city and trying to keep them safe,” he said. Stephenson is set to announce her finding at a 1 p.m. hearing Thursday.